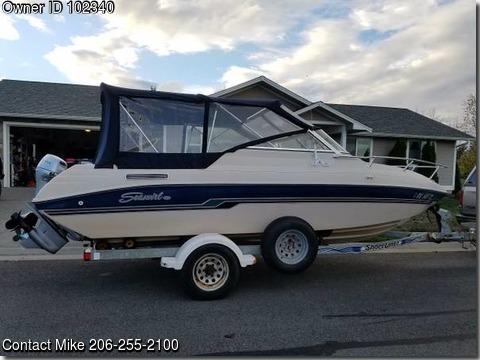 Boat is located in Sequim,WA.Please contact the owner @ 206-255-2100...New 5.0 multi port fuel injected Volvo Penta with duo prop outdrive. Like new Honda 9.9 kicker with power trim/tilt, electric start, charging system and high thrust extra long shaft. Kicker is a 2012 purchased in 2013 with warranty still left. Shorelander galvanized trailer w/spare tire. Also included is brand new 7" Lowrance GPS, porta potti, in dash cooler, fenders, dock lines and full canvas. With 2 people and half tank of gas boat ran 47 MPH. Totally enjoyed this boat this past season and have purchased a larger boat for longer trips.